No? Well before you ditch the deodorant and become an all natural hippy, I want to share a story with you. Deodorant - What Are You Really Putting On Your Skin? I guess I'm one of those fragile butterflies with sensitive skin. You see I've always had problems with deodorant. When I was a teenager I tried one of the latest antiperspirants that was promoted heavily on TV. I don't know if it was because it was meant to make you a chick-magnet, or more for it's anti sweating abilities (I played a lot of sport, and I kind of sweat easily. But I do know that any of the girl pulling powers the deodorant possessed where to be neutralised. I developed an epic itchy and unsightly rash under both arms. Embarrassed, but unable to bear the pits of torture, I showed my problem to my parents. My dad, a man of few words, bluntly said 'Change your deodorant', meanwhile my mum races off to find me some soothing cream. Change my deodorant?! But this was the smell that all the cool kids wear, and it's supposed to turn me into a chick magnet! 10 years later a lot has changed. Firstly I'm no longer under the spell of tv marketing (I don't watch TV), and I have finally solved my deodorant problems. My chick magnet abilities are no longer needed as I have a beautiful girlfriend. As a teen I often developed rashes in my underarms. After I discovered my Dad had the same problem, I figured I'd learn from those who had gone before me and use what he used. That was Brut. In particular, the green 'flavour'. It worked well , there was no rash and I think it smelt ok. So anyway this was my deodorant for about 7 years. As my journey into the health & fitness world intensified (read about my story here), I soon discovered that not only does food impact your health, but also what I put on my skin. Your skin is semi-permeable, meaning it can absorb a lot of things you put on it. Have you ever wondered how transdermal patches work? You know those nicotine patches, or even testosterone gels or creams? Well your skin is a great transport mechanism, it bypasses the gut and liver that act as a filter, and directs chemicals straight into the bloodstream. Different areas of your body absorb things at different rates. Areas of your body that are high in sweat pores and or have a lot of blood flow near the surface tend to be better at absorbing chemicals. Sites such as your feet, your groin area, and of course your armpits. Parabens are widely used preservatives used in cosmetic and pharmaceutical products. Parabens safety is still under debate in the literature, but there is evidence to show that the body absorbs the stuff and it doesn’t necessarily all get excreted in the urine. It has also been shown to disrupt the body’s endocrine system and have estrogen like effects. In men this messed with our all important testosterone/estrogen ratio. And if you're aiming to increase your testosterone naturally you could be ruining all your hard work by directly applying parabens onto the skin. Your brand name deodorant may smell great, but the ladies may prefer you go without in the long run! Commonly used in anti-perspirant deodorants. Why? because the aluminium effectively blocks the sweat ducts under your arm. Great if you don't want to sweat (however I should mention there are a lot of benefits to sweating - blog post coming soon), but not great if you're trying to keep metals out of your body. High levels of aluminium in the body is linked to Alzheimer's & breast cancer. A petroleum based material, and has been linked to nervous system and organ damage. This is also often found in natural deodorants. People with sensitive skin (myself included) are prone to react to this. Classified as a pesticide by the american FDA. Used as an anti-bacterial (which will help decrease bad odours). It can accumulate in body fat, and can also possess endocrine disrupting properties that have shown up in human breast milk. Again, if you're looking to maximise testosterone, you may want to avoid deodorants that contain triclosan. These are made through a processed called ethoxylation which produces carcinogenic properties during manufacturing. Ok so if you haven't ducked off to see if these chemicals are found in your deodorant you probably should. Once I discovered all the harmful ingredients found in my deodorant I immediately stopped using it and instead went to my local health shop. The next few months reminded me of my teenage days, spending too much money on an assortment of deodorants (however this time they were 'healthy' brands), and constantly developing rashes that were so itchy I could have ended up in a straight jacket. Heres some photo evidence of what I had to deal with (note this was the result of an unscented, all natural deodorant found at my local health store). Plus it didn't even work as a deodorant. Eventually I settled on two products. This company makes deodorant that you could literally eat! All the ingredients are organic and natural - as they say on their site "NO Aluminum, NO Parabens, NO Toxic Chemicals, NO Fragrances, NO Corn, NO Gluten, NO GMOs and absolutely NO Bad Stuff!!" They use a base of coconut oil and shea butter combined with baking soda and essential oils. The stuff works great, however I have a few issues - first, as I have rather sensitive skin I have to use the Light or regular range. The strong range sets off a mild rash after a few days of constant use. Obviously the 'Light' range isn't as effective at reducing smell as the other ranges. I try to use the normal product range, but I do notice I need to apply it twice a day to be effective. My girlfriend uses the same stuff and can get by with one application a day (but she's not a 100kg male who sweats at the mere sight of a sun symbol on a weather forecast). Update - The company have just released a new product called 'Primal Pit Primer'. This is a combination of oils that you apply to the pits before applying the normal pit paste deodorant. It does seem to help, and I haven't noticed any reactions to the regular deodorant range after using the primer. I'm hoping with the help of the primer I'll be able to tolerate the Strong deodorant soon. If you have sensitive skin, I recommend starting with the Light range and also using the Primer oil. Also, I'm lucky enough to have a 15% off link for new pit paste shoppers. Just click HERE for 15% off your first primal pit paste order. Regarding 'flavours', I like Primal Spice, and my girlfriend likes the Lavender. So I actually stumbled on magnesium oil as a deodorant. I use transdermal magnesium oil daily - I apply it to my body each night before bed (see my article 'Why you should be supplementing with magnesium' for more info). One night I decided to spray it under my arms, the next morning I woke up and saw the oil sitting beside the sink. Knowing I only had one client that morning I thought I'd try it again instead of putting on the pit paste. Well later that afternoon I noticed my pits didn't smell! Anyway after doing some research I found there are a lot of people out there in interweb land that use magnesium oil as a deodorant. I still can't find out the mechanism behind HOW it works (if you know, please share! ), but all I know is that it does work, and its natural (plus its a great way to increase your magnesium levels). The only downside to using this is that there is no fragrance. If I want to have another attempt at smelling like a 'chick-magnet' I'll use a few drops of essential oils on my skin along with the magnesium spray. So there you have it, my journey for healthy and non smelly underarms is complete! It's no Lord of the Rings epic, but it was quite a quest for me. Hopefully you've learnt a thing or 3 from this post and you won't have to repeat the mistakes (and pain) that I had to endure. 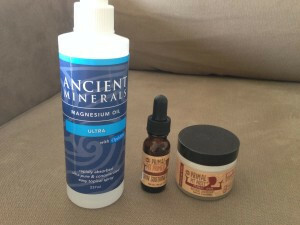 On a day-to-day basis I tend to alternate between the pit paste and the magnesium oil. I think the magnesium oil works better for me, but I do notice when I'm sweating heavy (ie during training) it's not that effective, in which case I tend to stick with the Pit Paste. I'd love to hear your thoughts. Are you worried about harmful chemicals in your body products? Do you have any of your own solutions? Perhaps you make your own?